Iconic "stupid sitcom" from the 1960s, filled with Idiot Plots, What an Idiot! moments galore, a Laugh Track, and a great cast of actors. The show featured seven stereotyped characters  a millionaire, his snobby wife, a famous actress, a farm girl, a college professor, an innocent misfit klutz, and the captain of the charter boat on which all of them had sailed  trapped on a Deserted Island. Their little colony of survivors was usually awash in schemes, alliances, betrayals, and petty manipulations, usually over the most minor of things. Their own foibles and blind spots frequently sabotaged any chance of rescue or escape, and nobody ever seemed to learn anything from their mistakes. ...Wait, did we get mixed up with the article on Survivor? How about Lost? No? Okay, just checking. Gilligan's Island was created in 1963 by veteran TV writer/producer Sherwood Schwartz (who would later make a career out of The Brady Bunch). Schwartz was an academic with degrees in zoology and psychology, and originally intended for the program to be a meaningful examination of American life. Inspired by Robinson Crusoe, Schwartz intended to create a microcosm of American society by stranding representative members of different subcultures and seeing how they interact. He chose his representatives carefully, claiming later that "Anybody who is watching can identify with someone." How this ostensibly academic and rather intriguing concept turned into the show that actually aired is anyone's guess.note CBS president James Aubrey and his vice president of programming, Michael Dann, might have been responsible, as they believed audiences needed "bosoms, broads and fun". It lasted for three seasons on CBS (196467), then became a perennial favorite in daily syndication. With its timelessness and endless amount of reruns, the series firmly cemented itself and its beloved characters a place in pop culture history. Three reunion TV movies followed, first rescuing, then re-stranding, then re-rescuing the castaways, who then turned the island into a resort. Two cartoon series, a stage musical, and a docudrama about the shows creation were also produced. In the strangest twist, though, 2004 saw Gilligan's Island become the first (and maybe only) Sitcom ever revived as a Reality Show, with the broadcast of The Real Gilligan's Island on TBS...a show which combined the original series with Survivor in a bizarre blend. Some of the cast reportedly disliked the show. The actress that portrayed Ginger (the movie star), Tina Louise, refused to do either the cartoons or the reunion movies because she considered the show "silly" and the concept ridiculous while also resenting that she'd ended up being typecast. A big-screen adaptation is currently trapped in Development Hell after an initial release date of March 30, 2012. Not to Be Confused with Gullah Gullah Island. Adaptation Dye-Job: Ginger was changed from a redhead to a blonde for the animated shows in order to avoid any complaints from Tina Louise over using her likeness. All Psychology Is Freudian: In some episodes, when Ginger assumes the role of psychiatrist, her first instinct is to ask the patient about things like their childhood. Of course, she's a case of I'm Not a Doctor, but I Play One on TV, so Hollywood Psych is probably all the psychology she knows. In the 1st season episode "Forget Me Not", the Skipper gets amnesia when a pole hits his head. When the Professor tries to cure him with hypnosis, he first reverts him to childhood and then makes him think it's still World War II. Hilarity Ensues. In the 3rd season episode "The Second Ginger Grant", Mary Ann is hit on the head and loses her memory, thinking that she's actually Ginger Grant. When the Professor tries to snap her out of it with hypnosis, Gilligan ends up hypnotized into thinking he's Mary Ann. Obviously Played for Laughs. And the Adventure Continues: 'So join us here each week, my friends, you're sure to get a smile'. And the Rest: Trope Namer. And You Were There: The "dream" episodes always utilized this. Animated Adaptation: The Filmation-produced The New Adventures of Gilligan (1974-77) and Gilligan's Planet (1982-83). Aside Glance: The Skipper's brief look to the camera after Gilligan does something stupid again (a Shout-Out to Oliver Hardy from Alan Hale, Jr.) Ginger occasionally does the same and shrugs when an attempt to seduce someone into doing what she wants fails. The Bad Guy Wins: Harold Hecuba and Eva Grubb not only get the usual Karma Houdini, but also successfully steal the Castaways' idea for a musical Hamlet and Ginger Grant's identity and movie career, respectively. Bag of Holding / Great Big Book of Everything: The Professor always had the facts he needed in a book that was conveniently at the top of his backpack. Bamboo Technology: Trope Codifier. The Professor was able to create some kind of battery substitute for their radio, build a fully-functioning hot air balloon, and also could fill Gilligan's cavities. Bare Your Midriff: Ginger and Mary Ann, frequently. Beauty Contest: The castaways hold one in "Beauty Is As Beauty Does." What do you think — Ginger or Mary Ann or Mrs. Howell?note The winner turned out to be an ape: Gilligan disqualified all the women for not being native to the island. (Plus, he was smart enough to realize that choosing one of the three women would get him in trouble.) When the Skipper, Mr. Howell and the Professor confiscate Gilligan's notes to find out who was leading on points, they find that all he did throughout the contest was play Tic-Tac-Toe... and lose every single time. Betty and Veronica: Mary-Ann the former, Ginger the latter. A well-known enough example that "Ginger or Mary Ann" is just as valid a comparison as the Archie characters. Breaking the Fourth Wall: In "Where There's a Will", when Mr. Howell thinks the castaways are trying to kill him after he includes them in his will, Mrs. Howell looks directly into the camera and says, "I'm going to get to the bottom of this." To be fair, the deposed dictator who escaped the island (in Season 2 episode The Little Dictator) did attempt to send a rescue mission once he regained power, but nobody believed him and he was overthrown again when the opposition painted him as having gone insane for continuing to bring up "a deserted island with people on it." Wrong-Way Feldman also tried his best to get them rescued, but his total incompetence at anything related to directions and navigation resulted in the location he gave for the island not even being anywhere close to correct. And the pro surfer who washed up in the lagoon suffered a case of amnesia when he made it back to Hawaii, so it's not really his fault. Karma just really hates the castaways for whatever reason. And Gilligan accidentally damaged the message recorded in the robot they sent walking (along the sea floor) back to Hawaii. The castaways think they'll be rescued when they find rare butterflies for renowned collector Lord Beasley, who (of course) then leaves without them. Unfortunately he's too obsessed with his lepidopterian pursuits to even mention them once he returns to the mainland. Subverted in the case of Erika Tiffany-Smith, played by Zsa-Zsa Gabor. Upon returning to civilization, she explained about the island and the Castaways, but could not offer the exact longitude nor latitude, plus her diary was written in Hungarian which no one in the Navy could read. The sailor who brought her could have told people, but creator Sherwood Schwartz stated that he "suffered a major coronary and died." The big-game hunter who'd been trying to shoot Gilligan was so spazzed out over his failure to do this that he sank into a catatonic state (after slinking off the island in secret), and when found, was just mumbling, "Gilligan... Gilligan...," endlessly, with no one able to figure out what he meant. Inverted with the episode where the Russian cosmonauts accidentally land on the island. They're more than willing to help the castaways get off the island, but the price for being rescued would be detention in the Soviet Union (as the Soviets don't want to admit their capsule landed off-course, and the castaways would be living proof of that). Given the choice between a lush tropical island and a Siberian gulag, this was one incidence where they worked to keep from being rescued by the wrong people! The Cameo: In the third reunion movie, Jim Backus reprises his role for one scene. This was due to his suffering from Parkinson's disease. He was originally going to be left out altogether for this reason, but Backus felt up to doing one scene and was welcomed by production. This led to an offscreen Heartwarming Moment, as Backus completed his scene and walked over to Dawn Wells (Mary Ann) and asked, "Was I funny?". She hugged him and assured him he was. To this day the incident makes her tear up as she recounts it for interviews. Celebrity Survivor: Ginger and the Howells. Christmas Episode: "Birds Gotta Fly, Fish Gotta Talk". Clothing Damage: Suffered frequently by the Skipper (usually as a result of something stupid Gilligan has done). Gilligan gets it sometimes as well. The Professor and Mary Ann have had it happen at least once each. Good thing they have that Unlimited Wardrobe. Confronting Your Imposter: Happens to both Gilligan (who meets a Soviet spy who looks just like him) and Mr. Howell (whose lookalike had begun attempting to steal his identity and happened to wash ashore on the island). In both cases, both actors played themselves and their characters' respective doppelgangers. Contrived Coincidence: In the sequel to the reunion, The Castaways on Gilligan's Island, Gilligan discovers that the island was actually a long-lost Army Air Corps base. Something they never figured out during their first fifteen years on the island. Costumer: The dream episodes tended to be these. Criminal Doppelgänger: Happened three times. Gilligan had a Russian spy double, Mr. Howell had a freeloader double, and Ginger had a... well, she wasn't a criminal until she went back and started using Ginger's fame. An odd one with the obscure 90's show Meego. The episode never made it to air in America but did air on Sky 1 in the UK. A sort-of one with ALF. Alf dreams he's on Gilligan's Island, and initially loves the idea... until he finds out that having to experience life like that every day can get really tiring. He then discovers that Gilligan, the Skippernote in Alan Hale, Jr.'s final onscreen performance as the character, the Professor, and Mary Ann all enjoy watching (on a specially crafted TV) a sitcom based around Alf's human family. Decided by One Vote: In "President Gilligan", the castaways determine they need an election to decide who'll be leader. The election pits the Skipper against Mr. Howell. Mr. Howell and Ginger votes for Mr. Howell. The Professor and the Skipper vote for the Skipper. In a surprise twist, Gilligan wins on a "write-in" ballot. Mrs. Howell, Mary Ann and Gilligan himself vote for Gilligan as President. Delirious Misidentification: A Played for Laughs example. The Skipper poses as a hostile native to get the Howells back together after they have a fight and gets hit on the head. He staggers off. Gilligan goes after him and asks him twice if he's all right. The second time he says, "For the last time, I'm all right, Mary Ann!" Deserted Island: The setting, rather obviously. Distinguished Gentleman's Pipe: The Professor, in the beginning. Sometimes other characters, in Dream Sequences. The Ditz: Gilligan is the most prominent example, but everyone (including the Professor) has had their share of goofball moments. Dream Sequence: Often the most imaginative part of the series, and the cast loved doing them. Drugged Lipstick: Ginger wears it in a Bond-parody dream sequence in "The Invasion". Egomaniac Hunter: Jonathon Kincaid, who decides that, in the absence of game on the island, decides to try Hunting the Most Dangerous Game with Gilligan. Everyone Calls Him "Barkeep": The Skipper and the Professor. Expository Theme Tune: "Just sit right back, and you'll hear a tale..."
Rearranged in Season 2, to add the Professor and Mary Ann to the Theme Tune Roll Call. Expospeak Gag: a lot of episodes would have the Professor and Gilligan do this. Expy: Gilligan and the Skipper were designed to be a modern day Stan Laurel and Oliver Hardy. Mary Ann is based on Dorothy from The Wizard of Oz; if being a pig-tailed girl trapped in a mysterious land is not enough, she used to live with her aunt and uncle in Kansas. In 1990, the Fox Network presented Woops! , a sitcom about the last six people to survive a nuclear bomb. Sherwood Schwartz threatened to sue, but since the show only lasted a few episodes before being canceled, the point became moot. Failure Is the Only Option: Carried over into the first reunion movie, but subverted for good in the second. Family of Choice: To the point of Undying Loyalty in Rescue from Gilligan's Island. All of the castaways vehemently defend each other to Jerkass friends to the point of unfriending them. Fast-Forward Gag: A few examples. Once was when the castaways were performing a series of repetitive actions and the film sped up, showing them doing the things really fast. Getting Crap Past the Radar: See here. Giant Spider: In the episode "The Pigeon," the castaways run into a Black Morning Spider. It's six feet long, has red eyes and weighs 500 lbs. Girl Next Door: Mary Ann, although in real life Dawn Wells was in the Miss America Pageant. note Miss Nevada 1959 Yet another case of "If she's the girl next door, I want to live on that block." Mr. Howell: It's not just a party, it's a coming-out party! Here We Go Again! : Just when they start adjusting to life on the mainland in Rescue from Gilligan's Island, they decide to take another three-hour tour, and wind up becoming castaways once again thanks to Gillgan's klutziness... however, they aren't marooned, as Globetrotters reveals they simply started a resort. Justified, as the island was no longer uncharted. Hollywood Natives: Played painfully straight with the various tribes who appear throughout the series' run. For example, the episode "Gilligan's Mother-In-Law" has a native family  complete with grass skirts, feathered headdresses, and bad language skills  choosing Gilligan to be a husband for their overweight daughter. Hollywood Voodoo: The witch doctor in "Voodoo". Hot Scientist: The Professor. Just ask the Estrogen Brigade. Hunting the Most Dangerous Game: A Season 3 episode has a visiting big-game hunter deciding to do this with Gilligan. I Am Spartacus: In the episode "Slave Girl", Gilligan saves a native girl from drowning and she becomes his slave due to I Owe You My Life. Later on a male native threatens to kill the girl's master so he can take control of her. 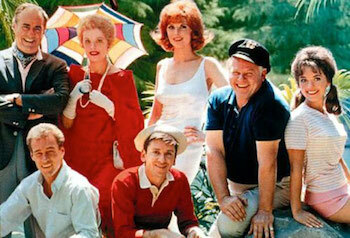 In order to protect Gilligan, first The Professor and then the Skipper say that they are actually her master. I Owe You My Life: A final-season episode has a native girl offering herself as Gilligan's slave after he rescues her from drowning in the lagoon. Island of Mystery: A plot-sensitive volcano, cannibals from neighboring islands, giant spiders, mysterious caves, and seemed to be a magnet for eccentric-characters-of-the-week. Imagine Spot: The show could give Arthur a run for their money in this department. At least every other episode had at least one. I'm Not a Doctor, but I Play One on TV: Ginger once played a psychiatrist a movie and in more than one episode has attempted to apply that in real life. Inheritance Murder: In one episode, Mr. Howell changes his will to include his fellow castaways. Then a group of circumstances make him think they're trying to kill him. However (predictably), that's wrong; they were collaborating on a surprise party for him. Interclass Friendship: Mr. and Mrs. Howell are upper-class and extremely wealthy, but they become friends with the rest of the Castaways (of whom only movie star Ginger Grant might be anywhere near their "class") during the time they're marooned on the island. Mr. Howell even changes his will for them and during Rescue From Gilligan's Island, they throw out a couple of upper-class guests for insulting Gilligan and the Skipper. Island Help Message: Attempted many times, as you might expect, and usually without success. It Seemed Trivial: In the episode "V is for Vitamins", the Professor is concerned about the lack of vitamin C in the castaways' diets and they try to grow oranges, even though the island has the wrong climate. It turns out that the island is ripe with grapefruit and lemons, which Gilligan knew about but didn't say anything because he didn't know that those fruit had vitamin C in them. It Will Never Catch On: Many people said this about the show, including Natalie Schafer; since the pilot was filmed in Hawaii, she initially did it only for the free trip. Just Eat Gilligan: Trope Namer, by way of MST3K. One comes to wonder why, with Gilligan's bumbling nature so often ending up sabotaging the rest of the cast's attempts to get back to civilization, that they didn't find some way to limit his potential to do damage, if not by straight up killing him then at least incarcerating him. Karma Houdini: For such a seemingly innocent kids' show, it was loaded with these. Of all the many, many guest stars who would show up on the island and meet the Castaways, nearly all of whom would deliberately, maliciously choose to not only leave the Castaways on the island, but also tell nobody about them. Sometimes, the Castaways would hear over their radio that some of these jerks faced some Laser-Guided Karma. But not that often. Not so fast. Mister Howell's impostor was described as being messed up beyond recognition when he was found. Also, Ginger's impersonator Eva couldn't have done all that well taking over her career. When Ginger got back during the reunion movies, her career was stalled, but not over. Laser-Guided Karma: Jonathan Kinkaid from "The Hunter". After spending an episode trying ( and failing) to hunt down Gilligan, he snaps and has to be packed off to a mental hospital, muttering the name of his intended victim the whole time. Large Ham: In one of the hammiest shows in television history, it really says something that Jim Backus as Thurston Howell III wins "Largest Ham" in a walk. Left Hanging: The original series was summarily cancelled; two of the reunion movies are about the gang finally getting off the island. Licensed Pinball Table: Released by Williams in 1991; click here for details. Limited Wardrobe: Gilligan, the Skipper, and the Professor pretty much always wore the same outfits outside of the "dream" episodes. And yet the ladies all seem to have a never-ending supply of clean and fashionable outfits to wear. This was actually explained in the show; Gilligan, Skipper, and the Professor only had the clothes off their backs, but Ginger and the Howells brought multiple outfits. Gilligan and the Skipper could plausibly have kept a couple changes of clothes on board, so they had something to change into when they inevitably got their clothes dirty doing maintenance chores. These, however, would also quite plausibly be identical to their other work clothes. The Professor appears to have brought a spare shirt (a common enough thing for a professional man to have with him at all times) that Mary Ann appears to have acquired as sleepwear. Lots of Luggage: Thurston Howell III, his wife Lovey, and Ginger all took along much more luggage (mostly clothing) than they should have needed for a "three hour cruise". On one of the occasions where they had a chance to escape the island, they insisted on taking all of their luggage with them. How insane their luggage is takes multiple episodes to understand. At one point, there is a plan to use what is by then an empty steamer trunk of theirs as a bathtub. Another episode shows that they brought an entire steamer trunk of cash with them (for a short cruise on a boat with no indication of anywhere on board to buy anything). Lysistrata Gambit: The girls move to the other side of the island in one episode in an attempt to force the men to build more huts. This wouldn't even count as a G-rated example if Mrs. Howell didn't specifically cite the Trope Namer! Madness Mantra: In "The Hunter", the ending reveals that the Villain of the Week, who had tried and failed to shoot the young first mate, snapped and was packed off to the mental ward muttering, "Gilligan... Gilligan... Gilligan." Mad Scientist: Dr. Boris Balinkoff in "The Friendly Physician". The Matchmaker: Mrs. Howell spends one episode trying to get Gilligan and Mary Ann together because she's bored and wants something to plan, like a wedding. Meaningful Name: In interviews, Sherwood Schwartz has (perhaps jokingly) said that the S.S. Minnow was named as a Take That! to Newton N. Minow, famous for his vast wasteland speech. The Millstone: Just about everybody is this to one or more of their fellow castaways at some point or another. Mistaken for Prank Call: The castaways once try tapping into a transoceanic telephone cable to call for help and, later, sending a homing pigeon with a message for help. The operator and the pigeon's owner both assume it's a prank. Mistaken for Dying: One episode had all the crew being mistaken for this after being bitten by a bug. The Musical: Adapted as a stage musical by Sherwood Schwartz and his son Lloyd. Ms. Fanservice: Ginger and Mary Ann generally. Mary Ann in a French maid's outfit in "'V' is Vitamin." Negative Continuity: Sometimes. Continuity was actually fairly good at first, but was relaxed as time went on. Mrs. Howell claims to be fluent in French in "You've Been Disconnected". In "All About Eva", she says she doesn't speak French. In "Pass the Vegetables, Please", Gilligan's favorite vegetable is spinach. In "Lovey's Secret Admirer", Gilligan's statement that he likes spinach causes the Professor's lie detector to go off. The whole plot of "My Fair Gilligan" revolves around Gilligan being adopted by the Howells, who state they have no son of their own. The Harlem Globetrotters on Gilligan's Island, however, introduces David Ruprecht as their fully-grown son Thurston Howell IV. This particular instance is also a case of Real Life Writes the Plot, as Jim Backus was too ill to manage more than a cameo as Thurston Howell III, so Howell IV was brought in as a Suspiciously Similar Substitute. "The Postman Cometh" establishes that Mary Ann does not have a significant other back home. In Rescue from Gilligan's Island, when the gang is finally rescued after 15 years on the island, she suddenly has a fiance who's been waiting 15 years to marry her. Nitro Express: "Operation: Steam Heat" had Gilligan drinking from a glass and thinking he had swallowed nitroglycerin. Everyone was worried that he might explode, though, if it had been nitroglycerin, he would have died from poisoning even if he could avoid the explosive effect. No Name Given: It was never established whether "Gilligan" was the character's first or last name, or what his other name was. Pre-production materials for the pilot indicate that the character was to be called Willy Gilligan, but the name never appeared in canon. Nothing Is the Same Anymore: In Castaways on Gilligan's Island, the Castaways are permanently rescued at last, make sure the island's location is properly recorded, and turn it into a resort. Oh, No... Not Again! : At the end of "Recuse From Gilligan's Island" the castaways reunite for a cruise only to have another storm knock them off course. Washing up on an island, they talk about how they have no idea where they are when Gilligan announces he does. When asked how, he produces a piece of driftwood marked S.S. Minnow. In the second reunion film, they cobble together an airplane, but suffer engine trouble. Gilligan falls out, parachuting back to the island, and they end up returning, where the plane promptly breaks upon landing. But subverted this time: they were in the air long enough to be spotted and tracked by radar. Older Than They Look: A real-life example in the form of Natalie Schafer (Lovey Howell), who was 63 when the series began. She kept her true age a secret, and it only became known after she died. The other cast members subsequently expressed surprise. Possibly not a good example, as the character indicated she already knew Mr. Howell in 1929, more than 30 years before the series (although given that the Howells come from an extremely exclusive social circle, they might have been formally introduced as early as their teens). Omnidisciplinary Scientist: The Professor, who was an expert in physics, chemistry, biology (botany and zoology), astronomy, engineering, linguistics, and any other field of knowledge needed. The Operators Must Be Crazy: In "You've Been Disconnected", an undersea cable washes up on the island, and the castaways rig up a phone to tap into it, getting a very uncooperative operator who does things like ask them to insert ten cents without listening when told there's no place to put money in an undersea cable. Phrase-Catcher: Gilligan is the target of Skipper's "Little Buddy". Pilot: The original, unaired pilot has a different, calypso-style theme tune which mentions a "six-hour ride" instead of a "three-hour tour," different actors playing slightly different versions of the Professor and Ginger, and an entirely different character in the Mary Ann role. A small amount of footage from the pilot was used in the first broadcast episode, "Two on a Raft"; and the entire plot was recycled as a flashback in the Christmas episode "Birds Gotta Fly, Fish Gotta Talk", with scenes featuring the original actors re-shot with the series regulars. Poorly Disguised Pilot: The second reunion movie, The Castaways on Gilligan's Island, was an obvious attempt to turn the show into a combination of The Love Boat and Fantasy Island, with Mr. Howell building a resort on the island so random Special Guest Stars could experience the Castaway life. Power-Up Food: In "Pass the Vegetables, Please", the castaways gain superpowers after eating a shipment of radioactive vegetables. In "Seer Gilligan" they eat seeds that gave them telepathic powers. Rapid Aging: In the episode "Meet the Meteor" a meteor lands on the island. Anyone near the meteor ages at an accelerated rate. Reality Changing Miniature: A witch doctor uses the Hollywood Voodoo doll version to control the castaways in the episode "Voodoo". Reality Ensues: One episode had Gilligan have to survive 24 hours being chased by an Egomaniac Hunter who decided that Hunting the Most Dangerous Game was an acceptable alternative since he'd come to the island to hunt, but there was no game. Once the plot's over, even though Gilligan survived, the hunter doesn't take them back because if word got out he'd tried to murder a man for the thrill of the hunt he'd be arrested. Reality Show: A very strange case. A reality show was made where they would round up several millionaires, movie stars, sailors, idiots, professors, and what have you, and do a Gilligan's Island version of Survivor to see who best represented the original characters. It had two seasons. Recycled In Space: Gilligan's Planet is one of the quintessential examples of this trope. Recycled Premise: The syndicated 1973 sitcom Dusty's Trail was essentially Gilligan's Island set in The Wild West. It even starred Bob Denver as the klutzy title character, with a burly wagonmaster as his boss, a millionaire and his wife, a saloon-girl dancer, a "book-smarts" Easterner, and a farmer's daughter. Red Eyes, Take Warning: Episode "The Pigeon". The castaways run into a Black Morning Spider. It's six feet long, weighs 500 lbs. and has red eyes. Reed Richards Is Useless: The Professor can do miracles with Bamboo Technology, but he can't build a raft or fix the Minnow, which would solve the single most pressing problem in that little microcosmic society. Lampshaded in the movie Back to the Beach, when Bob Denver (playing an Expy of Gilligan) laughed that he knew "a guy who could build a nuclear reactor out of coconuts but couldn't fix a two-foot hole in a boat." They attempted to repair the Minnow in a first season episode using tree-sap which had super-glue like properties. They found out too late that the adhesion was temporary, and had already coated the Minnow with it, causing the boat to fall apart. There were also multiple attempts to make nails out of various metals refined from ores inexplicably found on the island. (Later on the Professor mentions that there cannot be iron ore on the island because of what this type of island is composed of.) All fail in some way (on-screen failures included shattering like glass or exploding when hit with a hammer). They did build a handful of rafts over the course of the show. The Hand Wave explanation for why they couldn't sail home was that prevailing ocean currents couldn't get a small raft into the shipping lanes. The Remnant: In one episode, a demented Japanese soldier who doesn't realize WWII is long-over arrives on the island and begins ambushing the castaways one by one. Reunion Show: The TV movies Rescue from Gilligan's Island (1978), The Castaways on Gilligan's Island (1979), and The Harlem Globetrotters on Gilligan's Island (1981). Screw the Rules, I Have Money! : The Howells, even when their wealth is meaningless on a deserted island. Series Goal: Getting off the damn island. It finally happens in Rescue from Gilligan's Island (1978), until they decide to take a cruise, and Gilligan botches it up, resulting in them landing back on the island. Seven Deadly Sins: Gilligan is Gluttony (and easily bribed by coconut cream pies, at that! ), the Skipper is Wrath, Ginger is Lust, Mary-Anne is Envy, the Professor is Pride, and Mr. and Mrs. Howell represent Greed and Sloth, respectively. Word of God says this is intentional. Oddly enough, in the reunion movie Rescue from Gilligan's Island, the Professor lists the Seven Deadlys as elements the comparatively wholesome and honest Castaways encounted from others as they returned to civilization. Ship Tease: A Running Gag for the Professor in Season 2, where, in 4 different episodes, he's teased with Mary Anne, Ginger, visitor Erika Tiffany Smith, and even helps Mrs. Howell pull an Operation: Jealousy. Shrunken Head: In more than one episode the castaways, and especially Gilligan himself, are worried that the cannibal tribes from nearby islands will eat them and shrink their heads as souveniers. The 60s: This show could only have been made in that decade. Sleeping Single: The Howells, as shown in episodes such as "Up At A Bat". Smack on the Back: A Method actor appears on the island preparing for his upcoming film role as Tongo the Ape-Man. The island regulars think he really is an ape-man. Ginger tries to teach him to speak a la "Me Tarzan You Jane." Status Quo Is God: No matter what situation they're in or who visits the island, every episode ends the same way  the castaways are still stranded and nobody learns a damn thing. Stranger in a Familiar Land: In the first reunion movie, the characters suffer from this after being rescued and returning to the States: Ginger is upset that raunchy movies have replaced the glamorous ones from her time, the Professor's inventions have been created in his absence and he's being pressured to spend all his time fundraising for the university, the Howells have moved beyond their wealthy society friends, and Mary Ann has outgrown her fiancé. Stripping Snag: In "Beauty Is As Beauty Does", Gilligan accidentally hooks and reels in a swimming Mary Ann's bathing suit while fishing. Superstition Episode: A common theme in Gilligan's Island. The Skipper was extremely superstitious regarding voodoo and island curses, which manifested itself in the series frequently. Examples: In "Waiting for Watubi", Skipper unearths a tiki idol which he is convinced will bring him bad luck. In "Voodoo Something to Me", The Skipper is convinced that a voodoo witch doctor has turned Gilligan into a chimp. In "Voodoo", Skipper believes that a witch doctor has stolen some of the castaways' personal possessions so he can taunt them from afar. And in this last instance, he's actually proven correct. Guest characters, specifically the rarely seen natives visiting from nearby islands, were also not above this. One instance had a depiction of an ancient tribal hero who happened to look exactly like Gilligan. They discover Gilligan isn't really their returned hero, but then panic and run away when, while chasing him, he drops the head of the statue he was carrying for humorous reasons and it looks rather like his head just fell off. Superstitious Sailors: The Skipper's superstitiousness is a running trait, often putting him into conflict with the Professor. The show varies with regard to whether what he's worried about is actually real. Suspiciously Similar Substitute: Thurston Howell IV for his father in the third reunion movie. Take That! : The Minnow wasn't named after the fish, but after then-FCC chairman Newton N. Minow, who had described television as a "vast wasteland". This Is My Side: Between Gilligan and the Skipper in "Ship Ahoax". Tropical Island Adventure: The series takes place on the titular tropical island. Two out of Three Ain't Bad: In the episode "The Hunter", the Castaways are trying to reassure themselves that Gilligan will escape from the eponymous character. Skipper: He'll never catch him. My little buddy is too fast. Mr. Howell: Three out of four, that's not bad. The Three Faces of Eve: Mrs. Howell (as her name implies) is the wife, frequent Heroic Seductress Ginger is the seductress, and sweet Girl Next Door Mary Ann is the innocent. Unexpectedly Dark Episode: Many of the episodes didn't include any kind of threat at all (except perhaps the threat of never getting off the island). Then came "The Hunter", with big-game hunter Jonathan Kinkaid arriving on the island and taking advantage of the castaways' predicament to stalk Gilligan all over the island in an attempt to get over his boredom by hunting a human. Unlimited Wardrobe: The Howells, Ginger, and Mary Ann. Induces lots of Fridge Logic. In the alternate theme song for the unaired (until 1992) pilot, the Howells brought "just enough bags for a six-hour ride (six hours?)". Why they felt it necessary to bring these things is never mentioned, but they both had lots of clothes...and apparently Ginger and Mary-Ann are the same size as Mrs. Howell. Which tends to undercut some of the rationale behind events like Mary-Ann chopping rather a lot off of Ginger's dresses when she had amnesia and thought she was Ginger. Unobtanium: The MacGuffin in Globetrotters is the presence of a rare mineral on the island. Vampire Episode: "Up At Bat" has Gilligan bitten by what Skipper things is a vampire bat, convincing him that he will turn into a vampire causing Gilligan to dream a Bela Lugosi-like vampire story. Voices Are Mental: As a result of Mad Scientist Dr. Boris Balinkoff's mind-transfer experiments. Voodoo Doll: Used by the witch doctor in "Voodoo". Waxing Lyrical: The Skipper once quotes the closing theme song when he says, following the most recent failed escape, "I get the feeling we're gonna be here for a long, long time." Weirdness Magnet: You know, for an "uncharted desert isle" that island is a pretty busy place. Who Wears Short Shorts? : Mary Ann, often. Ginger attempts to give Gilligan a word association test in one episode. It does not work very well, however, as Gilligan can read minds at the time. In another episode, the Professor tries one on Mr. Howell. He responds "money" to every word. Except "child", which makes him say "tax deduction". World of Ham: Even for The 60s, this was one hammy show. Worse with Context: Gilligan is going off on another one of his stories about the people he grew up with and mentions that Skinny Mulligan got in trouble for giving the teacher an apple. When the Skipper says people don't get in trouble for doing that, Gilligan reveals that the apple had a worm. Yellowface: Italian-American actor Vito Scotti played a Japanese submarine captain in "So Sorry, My Island Now" and "Diogenes, Won't You Please Go Home?" You Are Better Than You Think You Are: Gilligan sees his likeness on a native totem pole and comes to believe that he is descended from headhunters and is doomed to become a headhunter himself. The Professor convinces him otherwise by offering up his own head as Gilligan's first prize; when Gilligan cannot bring himself to do the deed, he realizes he doesn't have the headhunting instinct after all and returns to normal. You Can't Go Home Again: The whole premise of the show. Then, they're finally rescued and make it back home... only to find they'd rather be back on the island. Thankfully, they retain contact with the mainland and turn it into a resort. Then invite the Harlem Globetrotters with Rolland Hand and Cinnamon Carter coming along for the ride. Zillion-Dollar Bill: In "The Sweepstakes", Gilligan wins a million-dollar sweepstakes and is invited to the Howell's country club. After feeling lonely he issues IOUs to the others so they may also attend. He quickly misplaces the wining ticket and they all get evicted. No phone! No lights! No motorcar! Not a single luxury! Like Robinson Ca-rusoe, it's primitive as can be! From seven stranded castaways, here on Gilligan's isle!